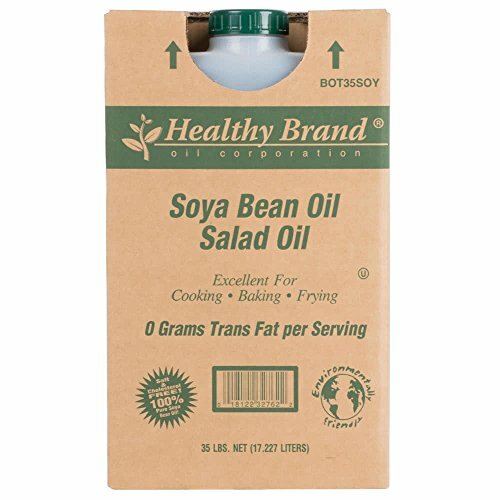 TableTop King Soya Bean Salad Oil - 35 lb. You'll find plenty of ways to use this soybean salad oil! Soya oil has a high smoke point and offers an inexpensive frying option for your commercial kitchen. You'll find excellent results when cooking or frying, and you can even whisk it into salad dressings. Its pleasant neutral flavor won't mask your finished product, and the consistent quality makes it perfect for everyday use. Extracted from soybeans, this dependable and multi-purpose soya bean salad oil is a great value for a variety of kitchen needs. Compared to other cooking oils, soya oil is low in saturated fats and high in beneficial fatty acids. Always keep a good supply of soybean oil on hand, and stock your restaurant, salad bar, concession stand, or diner with this economical, bulk 35 lb. supply!